SBI PO 6th May Exam Analysis updated for every shift on this page. Candidates who want to know Today’s SBI PO Review of Morning and Afternoon Shifts can check them here. You may also visit the official website www.sbi.co.in for the latest updates of SBI PO Analysis. SBI PO English, Numerical Ability, & Reasoning Analysis available here. Candidates can now check the SBI PO 6th May Prelims Review and you can also download the SBI PO Prelims 6th May Question Papers from the enclosed links. Keep visiting this page to know shift wise SBI PO Preliminary Exam Analysis – shift wise and topic wise. English – Easy to Moderate. 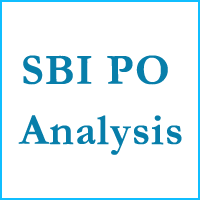 29th April SBI PO Analysis 2017 Available here. Check State Bank MT Prelims Exam Review 29/04/2017 for Morning & Evening Shifts. Get State Bank Probationary Officer Preliminary Question Paper Pattern on this page. Obtain no. of questions from each topic. Check good attempts for each section and overall difficulty level of State Bank of India PO Prelims Exam 2017. SBI Probationary Officer Prelims 29th April Morning & Evening Shift Exam analysis is provided here. Candidates who have attempted test can check today’s State Bank PO Preliminary Exam Review for both shifts. We have mentioned the each topic’s good attempts and their difficulty level. So, interested applicants can check overall SBI Management Trainee Exam Analysis on this page. For any other details, aspirants can visit the SBI official website that is www.sbi.co.in. State Bank of India PO Recruitment Notification in the month of February 2017 to fill 2313 Vacancies. SBI has invited the online applications for this “2313” Probationary Officier Vacancies from 07/02/2017 to 06/3/2017. The vast number of eligible candidates have submitted the online applications for this SBI PO recruitment 2017 before the last date. SBI PO preliminary exam has scheduled on 29/04/2017, 30/04/2017, 06/05/2017, 07/05/2017. Likewise, 29th April State Bank PO Review for Morning Shift & Evening Shift are provided on this page. So, willing candidates can download the 29th April SBI Management Trainee Analysis for Shift I & II through the below links. Name of Organization State Bank of India. Type of Test Computer Based Test. SBI PO Prelims Exam is for 100 marks. State Bank of India Management Trainee Prelims Examination has three sections. Exam duration for SBI PO Preliminary Test is one hour. SBI scale 1 officer preliminary exam is a computer based test. 0.5 Negative marking for wrong answers. Candidates who have attempted the 29th April SBI Management Trainee Exam can check overall exam review here. Through analyzing Today’s State Bank PO Prelims Review, you may know SBI PO Exam Tough level and exam paper pattern. Candidates can evaluate their good attempts through this State Bank Probationary Officier Analysis. Aspirants who are allotted for the next shifts of Exam can check 29th April SBI MT Review to know the question paper model. Through this, applicants can able to upgrade their preparation for the better score. We have mentioned the subject wise SBI PO Analysis for Morning & Evening Shifts. So, applicants, it is very easy to obtain SBI Scale I from this page. Therefore, the candidates can keep visiting our www.ibpsonline.co.in Website for more updates regarding State Bank of India Probationary Officer Preliminary Exam Review 2017.